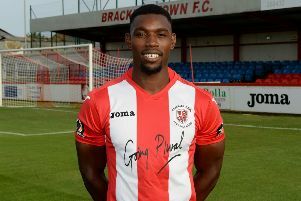 Alex Gudger’s sixth goal of the season earned Brackley Town a point in Saturday’s Vanarama National League North clash at Nuneaton Town. Saints had to come 2-0 down at in-form Nuneaton where they produced their worst opening 45 minutes of the campaign. But they fought back to earn a 2-2 draw and end Nuneaton’s eight-match winning steak. A first half horror show for Saints saw Nuneaton go in at the break two goals to the good as on-loan striker Jordan Nicholson, who netted five times last Saturday, and Greg Mills were on target as the visitors laboured and were generally out of sorts. Saints should have taken an early lead themselves as Lee Ndlovu sent Steve Diggin away and his cross found Jimmy Armson with perhaps too much time and in too much space and the header was planted too high. The second period was indeed a complete turnaround as the away team dominated almost from start to finish. Diggin was replaced by Matt Lowe as Saints played with a single striker and that brought the wing-backs more into the game with both Glenn Walker and David Moyo making outstanding contributions. It was from a pin-point Glenn Walker cross that Saints halved the deficit after 73 minutes as Lee Ndlovu headed in, his effort carefully directed beyond the rooted keeper Christian Dibble. The goal breathed further belief into the visitors whose midfield creativity was now potent. Moyo’s superb cross somehow saw substitute Jack Bowen fail to connect and Armson’s jinking 87th minute run earned another corner taken by Shane Byrne. Ndlovu headed goalwards through a crowded area and the ball appeared to cross the line before being headed out. But Gudger headed the ball back over the melee and into the net saving referee Martyn Rawcliffe the dilemma of ruling on the first effort. Into four minutes of added-time Saints pushed for the winner. But Armson fired over, Lowe could not convert another fine cross from Moyo and Bowen was unable to find the goal from a far post position in the final seconds. On a tricky playing surface both sides had contributed to a fine contest in a game of contrasting halves. Saints boss Kevin Wilkin said: “The first half was our most disappointing 45 minutes of the season. We were loose, made individual errors and could not get our passing going.